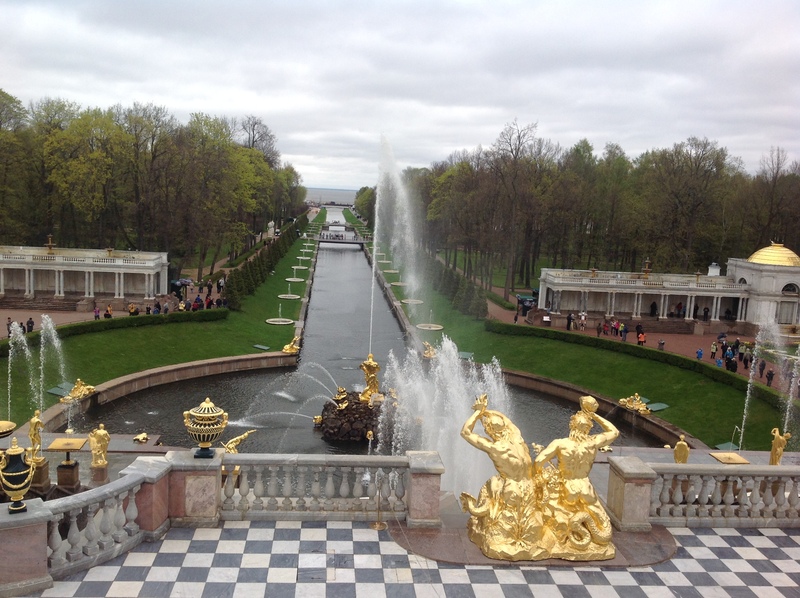 Tatiana picked us up and we headed out to Peterhof, Peter’s summer palace. In Peter’s time the palace was much simpler, but once Elizabeth ascended to the throne it became the over-the-top extravagance that it is today. Tatiana explained it’s not really that much of a trick– there’s a guy sitting there whose job it is to operate the spouts! 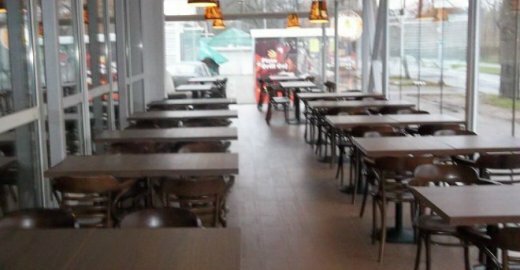 We stopped for a bite to eat at a cheburek café. 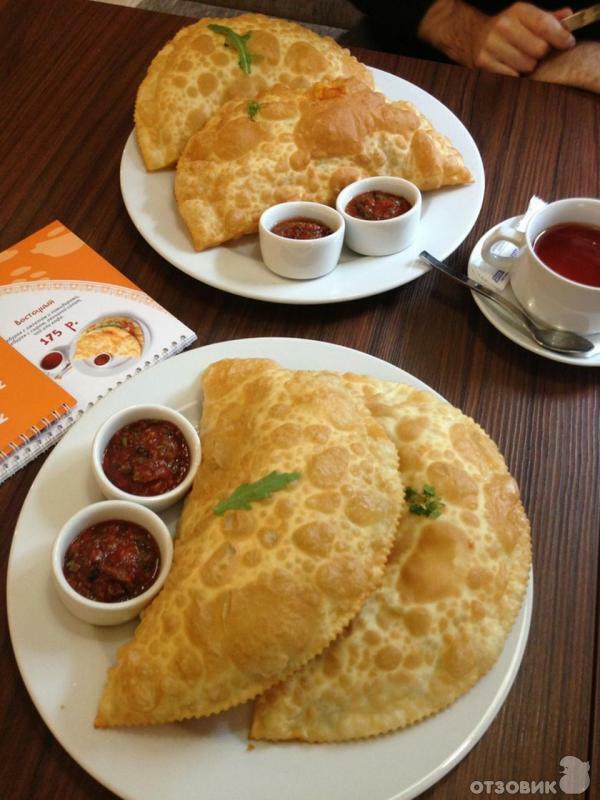 Chebureks are half-moon shaped fried pastries. It’s hard to tell from this would-be promotional photo, but our surroundings were gorgeous. We sat on the glassed-in patio, which gave us a nice view of the greenery outside. Somehow we got talking about my work and whether or not I wanted to continue working in immigration. I explained to Tatiana that I felt powerless to change the immigration system, which is the real culprit in the separation of families. Tatiana held up a menu. She said, “Ok, pretend this is a wall. How would you get to the other side of it? Tell me all of the possible ways to get to the other side.” The first one I named was to use force to push through. I named a few more, like using a ladder, giving up, etc. She said, “It’s very interesting. The one thing you did not mention is asking for help.” She’s a smart one, that Tatiana. 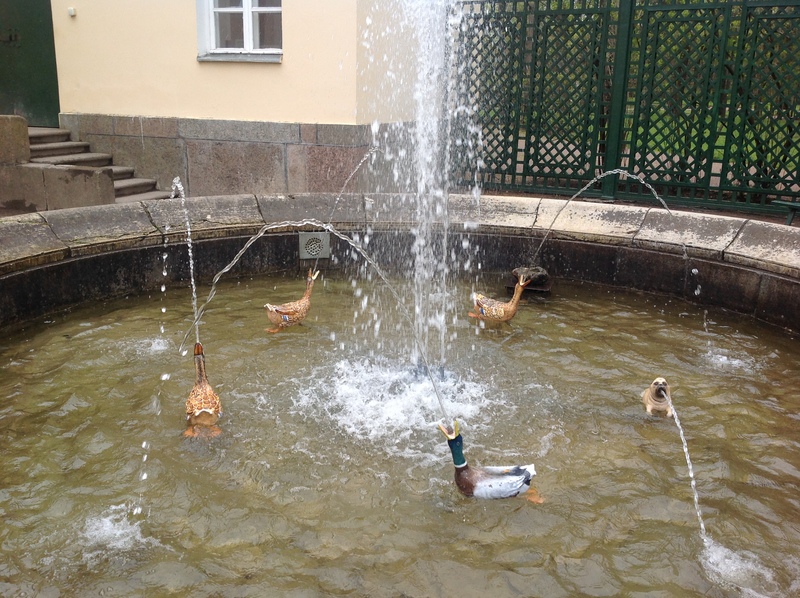 After our snack we went to the Cottage Palace at Peterhof. 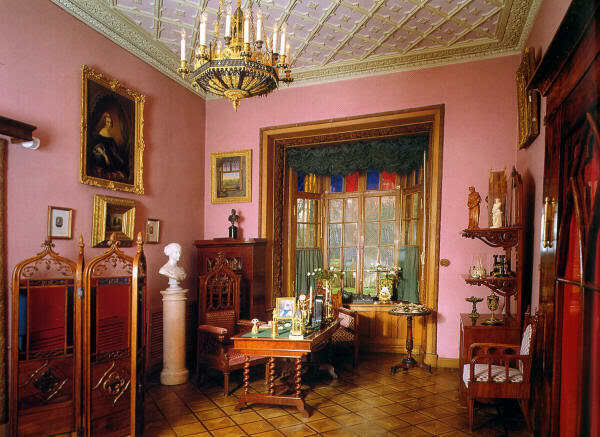 In contrast to all the grandiose palaces we’ve seen all week, this palace was a small and modest living space. 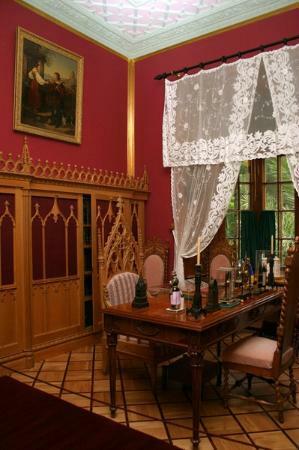 Nicholas I had it built to please his wife, who felt that living in the other palaces was oppressively regimented. She wanted a place where she could just be herself. Photography was not permitted inside, so these images are from the Internet. Surprisingly, my parents didn’t photograph the outside of the palace, either. I think they were getting really tired, honestly. The interior of the palace was certainly elegant, but in comparison to the explosion of gold in the other palaces, it comes off as very restrained. 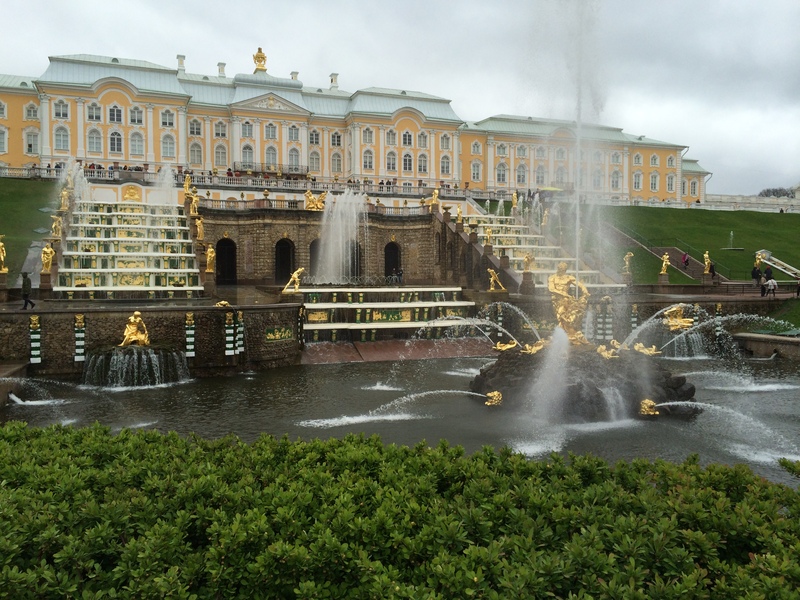 It’s kind of ironic that it was Nicholas I who built this palace. He was an extreme autocrat, even more so than usual tsars, and he expended a great deal of energy to oppose even modest attempts at reform. But his wife preferred the simple life. 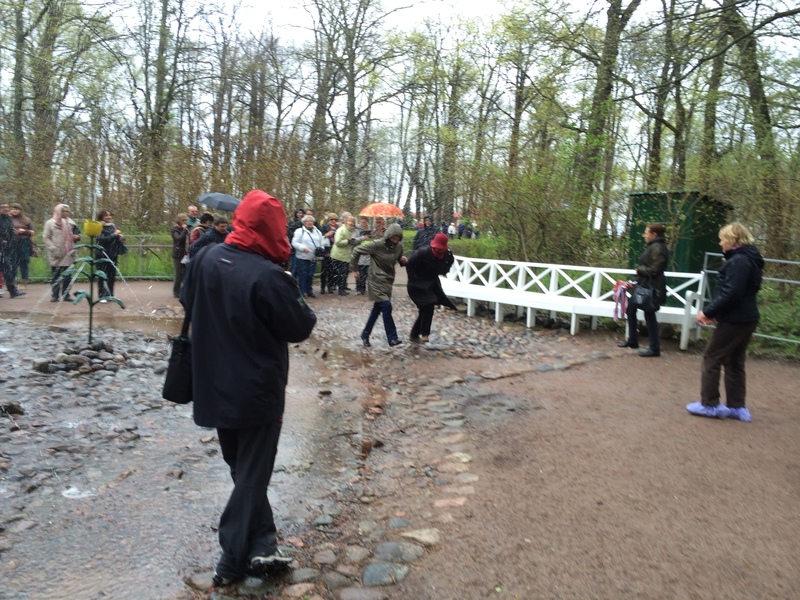 Tatiana drove us from the Cottage Palace back into the city and stopped to show us several metro stations of note. 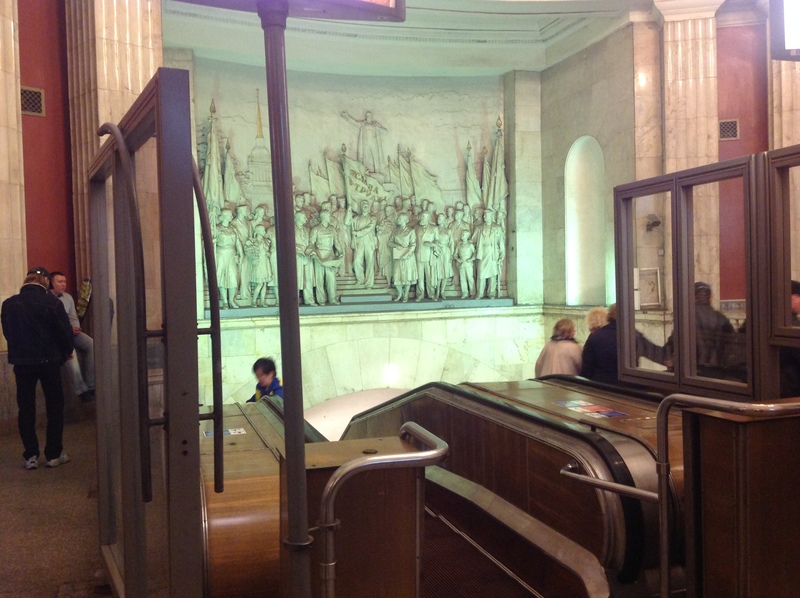 These were the first metro stations built in St. Petersburg, opening in 1955, two years after Stalin’s death. 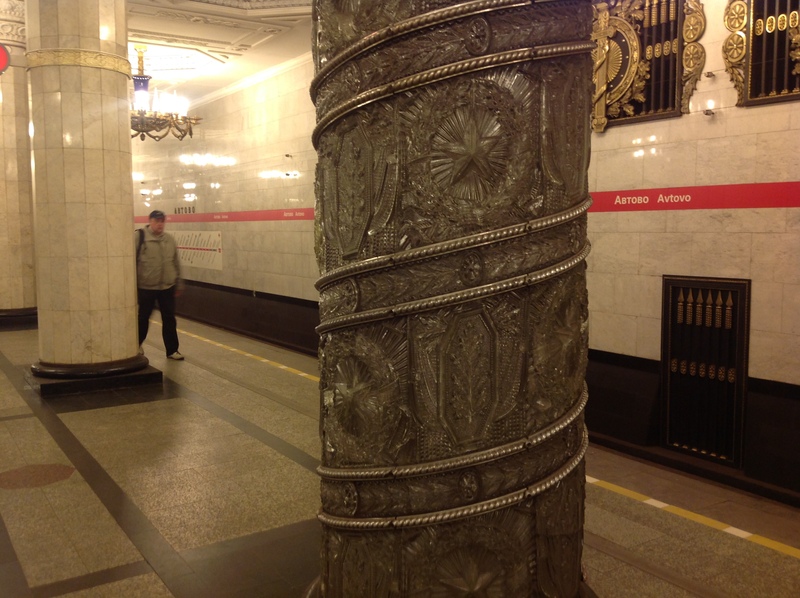 Stalin was the one who had insisted on the “underground palaces” of the metro. Khruschev later rejected this idea, so the stations that were built after this period were more modest. First we stopped by Avtovo. This station is unique because it has columns that are covered in glass sculptures. According to Tatiana, the idea was that, in the bright, shining Soviet world, even glass could be made strong enough to hold up a ceiling. Narvskaya was originally supposed to be called Stalin station. 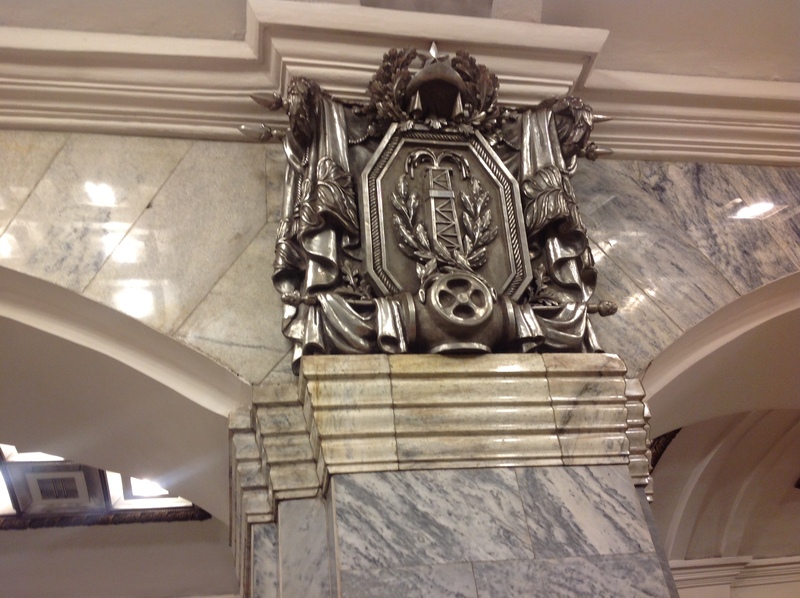 There was supposed to be a quote from Stalin engraved in the vestibule, but it never happened. At the end of the underground platform there used to be a giant Stalin mosaic, but it was covered over in 1961. 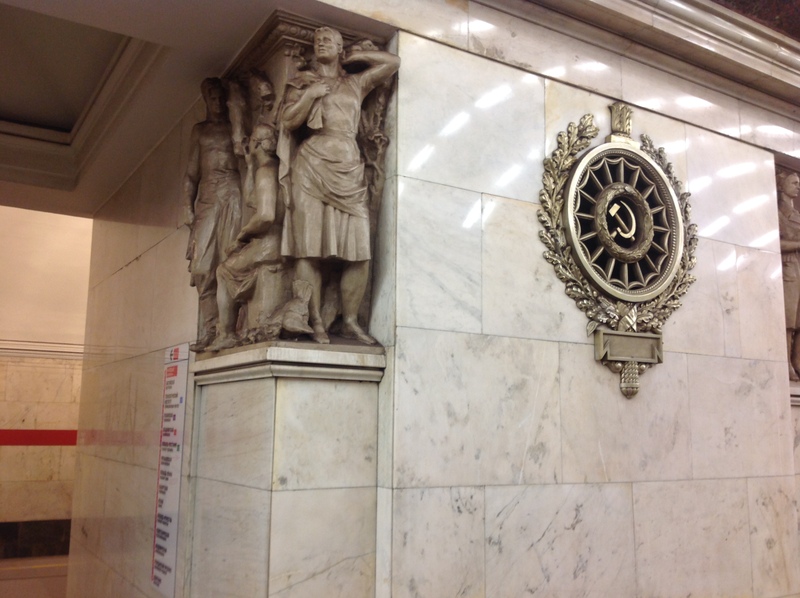 The above-ground part of the station contains this relief where all these workers are looking toward the steps in the center. What is now just an ordinary worker was supposed to have been a portrait of Stalin. Exhausted, we quickly did some souvenir shopping and then went to dinner. 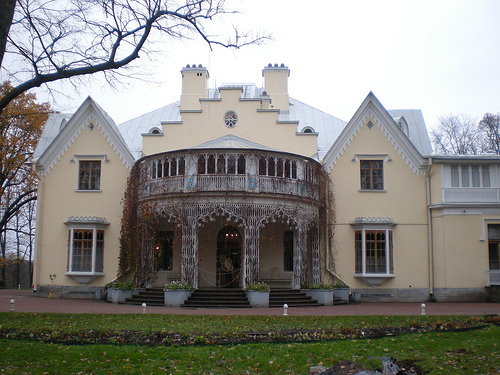 The place we ate, Volna, was a kind of nouveau-Russian restaurant. Instead of serving buckwheat and just calling it buckwheat, they called it “grechotto,” a combination of the word for buckwheat and risotto. Tatiana said she was having a truly Russian meal, ordering sushi. Russians are CRAZY for sushi. That’s a can of red caviar! 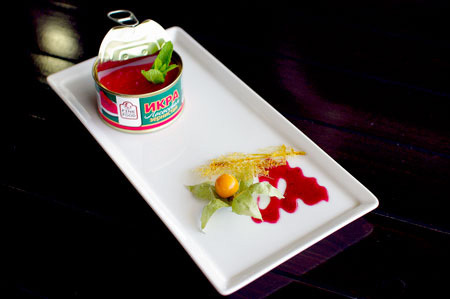 The panna cotta was served in the bottom of the can and then little tiny globes of strawberry gelatin were served on top, looking every bit like red caviar eggs. We fell all over ourselves oohing and aahing! This was a day of so many different influences. First, we DID stuff ourselves on the hearty Russian breakfast and felt bad that our hosts thought that we had not enjoyed breakfast the day before. We’re just not accustomed to such breakfast feasts! The weather influenced our energy. Cold, rainy, and wet! The beauty that was on display at Peterhoff did help to keep us going and our spirits up, despite the lousy weather. Readers may tire of hearing this, but Tatiana was incredible again. The Cottage Palace is an apt name for the place. It is a cottage, but it is also palatial at the same time. 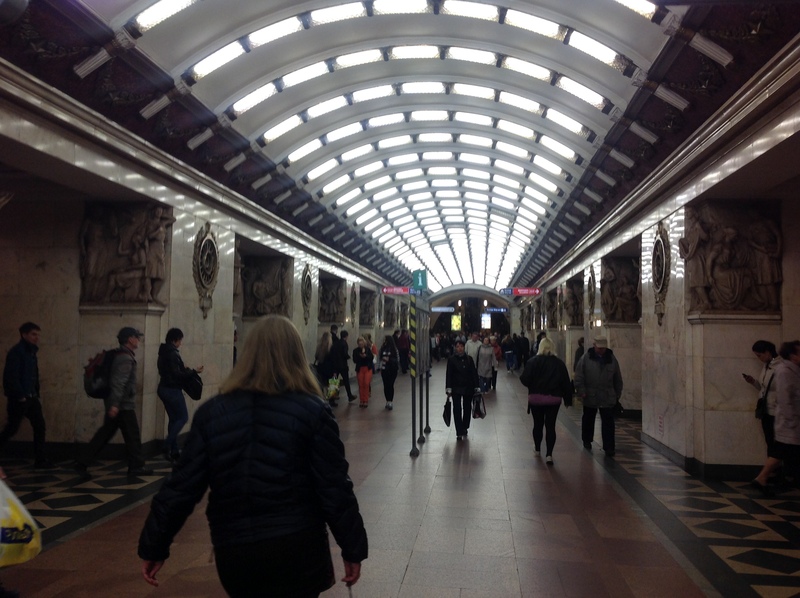 The subways in St. Petersburg we impressive. 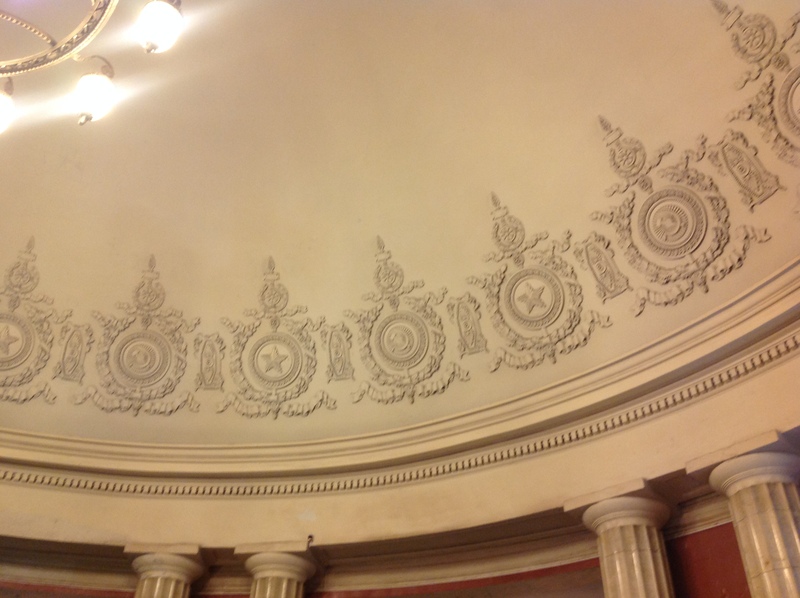 However, they were not as opulent as those in Moscow. Rachel’s description is right on the money. Impressive, but not quite as WOW! Ah, the dinner! 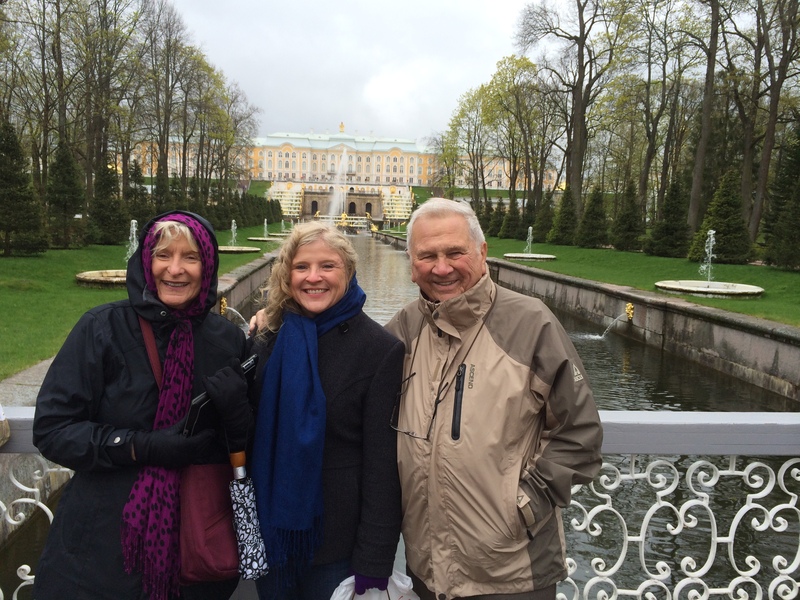 We enjoyed all our meals in Russia, but this place was one of the most memorable. Not only was the food good, my desert surprise looked just like caviar when the waiter put it in front of me. I am sure my face showed my shock. We’re not sure why this is so, but the restaurant had not only restrooms for men and women but also one labeled “Bi”. Who knows? 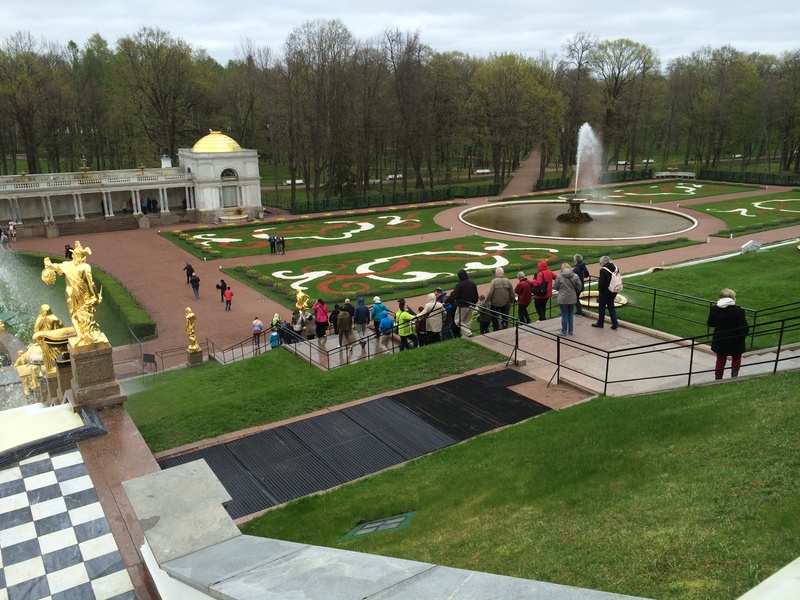 Weather notwithstanding, it was another spectacular day in Russia.